It's The 12 Days of BioWare, which means that Bioware and Treehouse Brand Stores are giving away over 100 prizes ranging from hoodies and art packs to customized gaming PCs and a PlayStation 3. Treehouse Brand Stores, in case you didn't know, provides a "turnkey solution" to companies looking to offer licensed and branded products to their customers through high-quality online stores. What's that mean? They're the people who operate the BioWare Store. And why do we care? 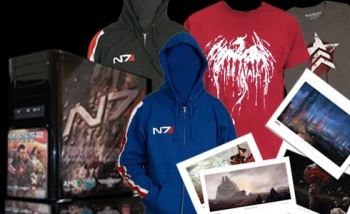 Because Treehouse is also holding a very cool holiday draw called The 12 Days of BioWare, a giveaway of Mass Effect and Dragon Age branded PCs, a Mass Effect PlayStation 3, Psyko headsets, clothing, games and more. The rules are simple. Go to The 12 Days of BioWare page at the Treehouse Brand Stores website. Log in with your Facebook account and "like" the BioWare, Dragon Age and Mass Effect 2 Facebook sites; then connect with your Twitter account and follow the biofeed, dragonage and masseffect2 feeds. Links are provided to make things nice and easy and while you can opt for just Facebook or Twitter, signing in with both earns two entries instead of just one. Draws will be made daily until December 22 - yes, we're a bit behind, but we just got the press release today. The contest is open to everyone, regardless of residency, but people who live outside the U.S. may end up on the hook for customs fees. For sweet swag like this, I'd say that's a fair trade. Good luck!